I value the ALL in INSTALL the most. The ALL stands for our alliance and that is very special and unique. This alliance is made up of manufacturers, industry experts, employers and installers. No other entity in the flooring community can coordinate teamwork as well as INSTALL because our alliance includes long-term and tangible commitments to each other. The alliance was initially founded through labor and management commitment. Together, both sides of the table created the structure to provide generations of INSTALL training in the form of established and sufficient training centers across the USA and Canada with a formal training standards recognized by federal, state and provincial governments. Originally our training curriculum was not the same in every training center. St. Louis’ was different than training in Vancouver, etc. 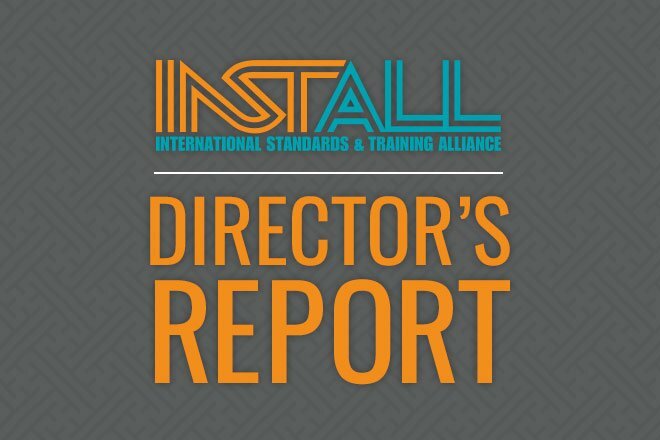 The INSTALL alliance recruited the participation of manufacturer technical experts to join with installers, employers and forensic experts to review all of the different training standards and combine them to create the standardized installation training that sets the bar for the industry. As conditions, techniques and materials change, the INSTALL alliance continues to collaborate to provide answers, solve problems and raise standards. Whether we are hosting educational outreaches with our manufacturing partners at our training centers, assisting in the research and development of new certifications and techniques, reviewing our curriculum to ensure that all installation skill sets are served or co-marketing to increase sales. The ALL in the International Standards and Training Alliance is making a difference in the floorcovering industry and together we are delivering work we can ALL take pride in.